This is where you will find the most common and most popular freshwater invertebrate species to be kept in freshwater aquariums. Use caution when stocking these freshwater invertebrates because some can be food for the fish and some of them will be the fish eater! Freshwater snail that does a decent job grazin on algae. They may also need supplemental feedings. 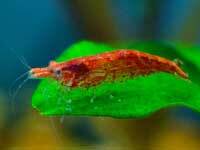 The cherry shrimp is fairly hardy and adapts to a wide range of water conditions.